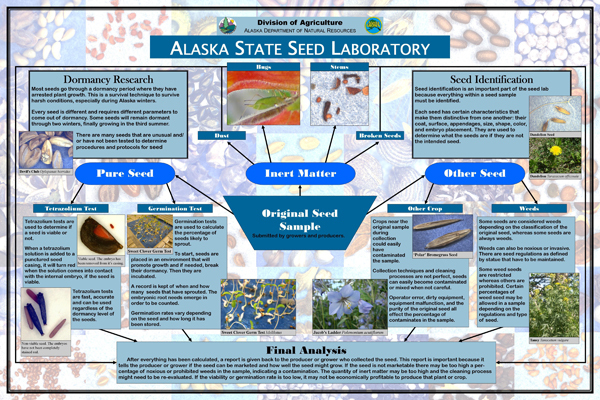 Alaska State Seed Lab at the Alaska Plant Materials Center is the only official seed testing lab of the state of Alaska. The lab is a member of the Association of Official Seed Analysts (AOSA) since 1998. The lab offers a variety of tests including purity, germination, tetrazolium (TZ), noxious weed seed, moisture content, seed count and growout. Our customers range from state and federal agencies to local seed growers, environmental firms and hobby gardeners. This test determines the percentage by weight of pure seed, other crop seeds, inert matter and weed seeds in a test sample. 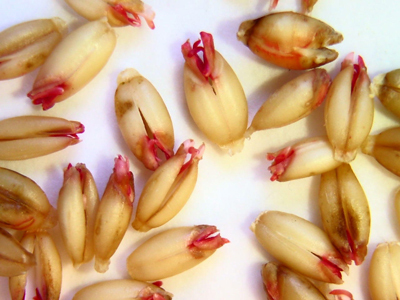 This is a physiological viability test which determines the percentage of live seeds that produce normal seedlings under favorable germination conditions. It requires 400 seeds for germination in most cases. This is a quick biochemical viability test which determines the number of live seeds lot based on dehydrogenase activity in seeds. It indicates the percentage of live and dead seeds in any sample regardless of its dormancy level. The test can be performed in 24-48 hours. It requires 200 seeds in most cases. 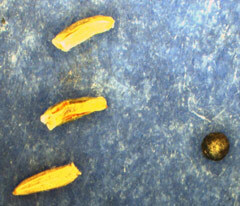 This test determines the presence of seed from plants that are especially undesirable and difficult to control. Report is based on Alaska noxious weed seed list. All-states noxious weed exam can be requested. This test determines the percentage by weight of moisture content in seeds. 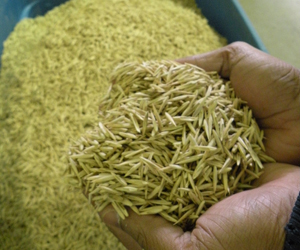 Seed moisture content affects the storage capacity of the seed, their germination and vigor. (100 seed weight, seeds per gram) - This test provides information about seed size, density, presence of small, underdeveloped seed in the seed lot. It helps to determine seeding rates. Test reports are a valuable tool for end users of seed. Contaminants such as inert matter, weeds and other crop seeds are reported, as well as germination potential. Required by federal law for interstate commerce and state regulations, seed offered for sale must have current and accurate testing and labeling. 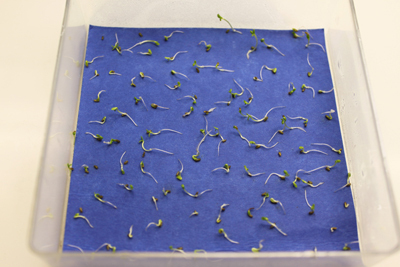 The seed lab conducts research into laboratory germination and dormancy breaking techniques, focusing on under-studied native species that are being considered for cultivation. 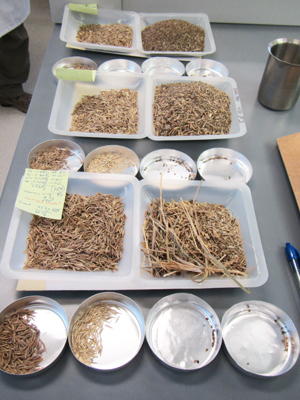 The seed lab also assists other state agencies and individuals in research on various projects including seed upgrade and viability enhancement, propagation techniques and invasive weed seed vigor. 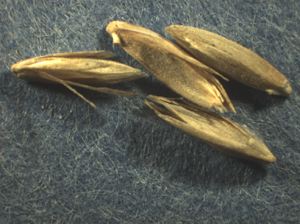 The Alaska State Seed Laboratory continues to train and educate personnel in seed examination to provide for continuity of service. In 2010 the lab received a technology upgrade consisting of an interactive whiteboard that is coupled with a high-powered digital microscope. Conference software running at the PMC allows these high-resolution images to be viewed and manipulated from the main conference room, assisting training and education efforts without putting sensitive lab equipment at risk. Visit the Seed Testing Laboratory Fees and Forms page for information on how to order a seed test.